During inclement weather, more than 100 Franklin County Engineer “Snow Fighter” personnel work around the clock to maintain safe travel on 766 lane miles of roads and streets, and provide road salt and anti-icing chemicals to 23 communities and public agencies. Snow Fighters participate in an extensive training program that involves both classroom and on-the-road instruction. Every year refresher classes are held to discuss snow fighting strategies, equipment operation and maintenance, and safe driving practices. Our plow drivers’ knowledge and maneuverability skills are then put to the test at our annual Snow Fighter Roadeo. Competitors are judged for their abilities to maneuver through a difficult obstacle course and in backing their vehicles. It is our goal to prepare the drivers for every type of on-the-road situation and hazard. 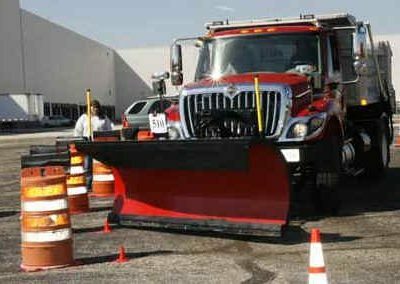 Snow Fighters are also judged for their skills in operating a front-end loader, which is used for loading plow trucks with salt and removing snow from roadways and parking lots. The Franklin County Engineer’s Office and the City of Columbus jointly operate an automated vehicle locating system (AVL) for snow and ice control equipment. During a storm event, AVL provides managers with unit and driver identification, vehicle location and speed, rate of application for salt and de-icing liquid, and road and air temperatures. The tracking system enables the county and city to better coordinate their snow and ice control efforts throughout the metropolitan area. Deicers include salt, the principal road clearing material; liquid calcium chloride, used as a pre-wetting agent and for additional melting power at lower temperatures; and salt brine, sprayed on roadways to delay freezing and enhance salt effectiveness. Salt is applied at an approximate rate of 400 pounds per mile along a two-lane roadway. During the 2011/12 winter season, we used approximately 3,700 tons of salt and 95,000 gallons of pre-wetting and anti-icing chemicals. 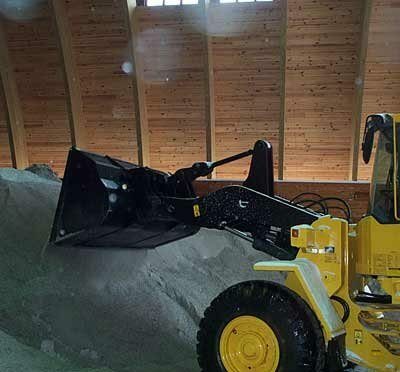 The 2012/13 winter salt price is $57.66 per ton, down $1.76 per ton from last year’s price. The total cost for snow and ice control during the 2011/12 winter season was just over $771,000. Computerized salt spreaders are used to guarantee prescribed application amounts that minimize costs and environmental effects. New de-icing products, that are safer and more effective, are always under consideration as suggested by the Ohio Department of Transportation and the Federal Highway Administration. 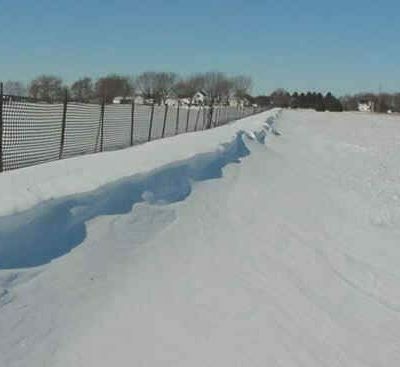 To control drifting snow, nearly 30,000 feet of snow fence will be erected along roadways that traditionally experience high winds. In agricultural areas, the engineer’s office will conduct its 13th annual program to encourage farmers to leave their partial cornstalks. When left uncut one to two feet above the ground, they are effective in helping to prevent snowdrifts. During past winters, cornstalk protected roads had considerably fewer snow drift hazards than those that were unprotected. This season, cornstalks will protect nearly 75,000 feet of roadway.